Tapestry weave of dyed wools and undyed (?) wool, plain (tabby) ground weave of undyed linen, H. 29 cm; W. 44 cm. Egypt, ca. 4th–7th century CE. The Metropolitan Museum of Art, Purchase by subscription, 1889 (89.18.252). 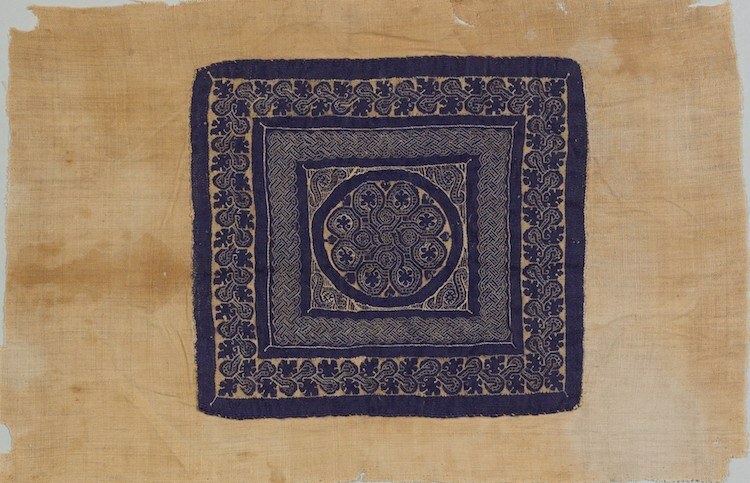 This fragment is made of silk and dyed with Tyrian purple, or Royal purple, or Imperial purple, a rare and expensive dye that was considered a status symbol and restricted for the elite. The use of this dye enhanced the expression of prosperity, and perhaps, its invocation as well.